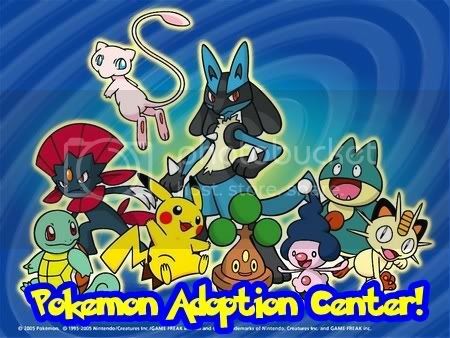 "Pokemon Adoption Center:Where you can adopt Pokemons...!" Hey there! 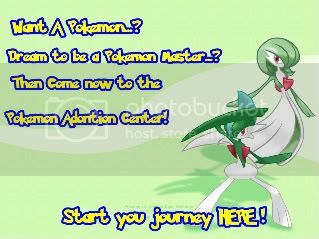 !Welcome to Pokemon Adoption Center or as knows as P.A.C. What you can do here is that you can adopt your fave Pokemon and bring them to you Profiles..! !Cool huh? Some of my graphics here are still not here in G-G*Not yet uploaded! *!Please don't save them in your files and upload them here...If I see any of graphics being uploaded in the site...I'll let the admins delete it..!Please..and I'm warning you! 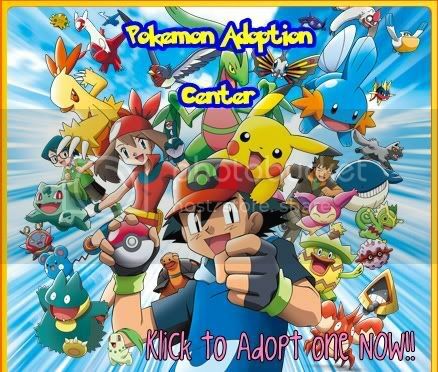 Login or register to add Pokemon Adoption Center as your friend! I think this owner asked permission of the real creators of this pokemon sprites or searched for them. Check This Out If you Want To Adopt! Even Though The Owner Isn't On Anymore You Can Still Adopt. This Might Seem Like Stealing but It's Not! And All The Weird People Out There Don't Report Me Because I'm Trying to Help You! 10) Check To Make Sure The Picture Of You're Pokemon Is There. If It Is You Have Did The Transformation Successfully!